Traveling at the speed of light for 2,538,000 years you would reach our closest galaxy, Andromeda. To put it simply – moving at 186,000 miles per second for over two and a half million years, covering a distance of 15,000,000,000,000,000,000 miles. 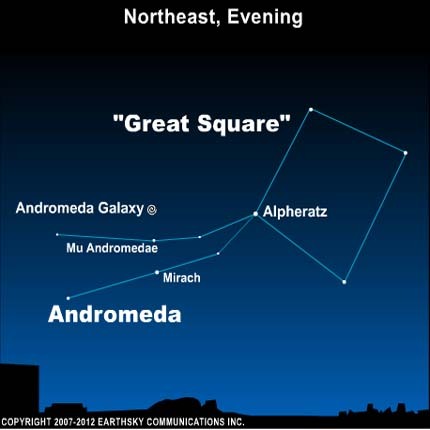 If you happen to be in the northern hemisphere and want to try finding Andromeda – now is the perfect time. Attempting Andromeda within cities or urban areas is futile – Andromeda requires the darkest of darkest skies. Look to the eastern sky around 9 PM and locate the Great Square of Pegasus. Think of Alpheratz as 3rd base – draw an imaginary line between first and third base – that line points towards Andromeda. Next allow your eye to adjust and find two “streamers” to the north (left) of Alpheratz. Streamers being “lines” of brighter stars. These “streamers” form constellation Andromeda. Find Mirach – the brightest star along the bottom line, let your eye draw a line between Mirach and the star Mu in the “streamer” above – keep going about the same distance above Mu, and say hello to Andromeda. I won’t promise a jaw dropping spectacle – more like a fuzzy smudge. Finding Andromeda isn’t about razzamatazz. Even if you fail – the act of finding two and a half million year old light from another galaxy, is worth the effort.